Unlike Tuesday, the US equity market failed to see a latter day rally, and that allowed the VIX to build very strong gains, settling +24.4% @ 18.53. There looks to be high probability of a test of the 20 threshold. Best 'fair case' for the equity bears...VIX 22, with sp'1980. So.. we've hit the first target zone of 17/18s, and today's daily close in the mid 18s does keep open a 'small' chance of the secondary zone of 22/25 being hit. That latter zone is a very clear price gap from the turn in mid October. VIX bulls need to be very mindful of next weeks FOMC. Whether the VIX is 20, 21, 22.. or even a little higher, what is clear, the appearance of the Yellen will very likely mark a key turn. US equities saw increasing weakness, with the sp' -33pts @ 2026 (intra low 2024). The two leaders - Trans/R2K settled lower by a significant -1.4% and -2.2% respectively. 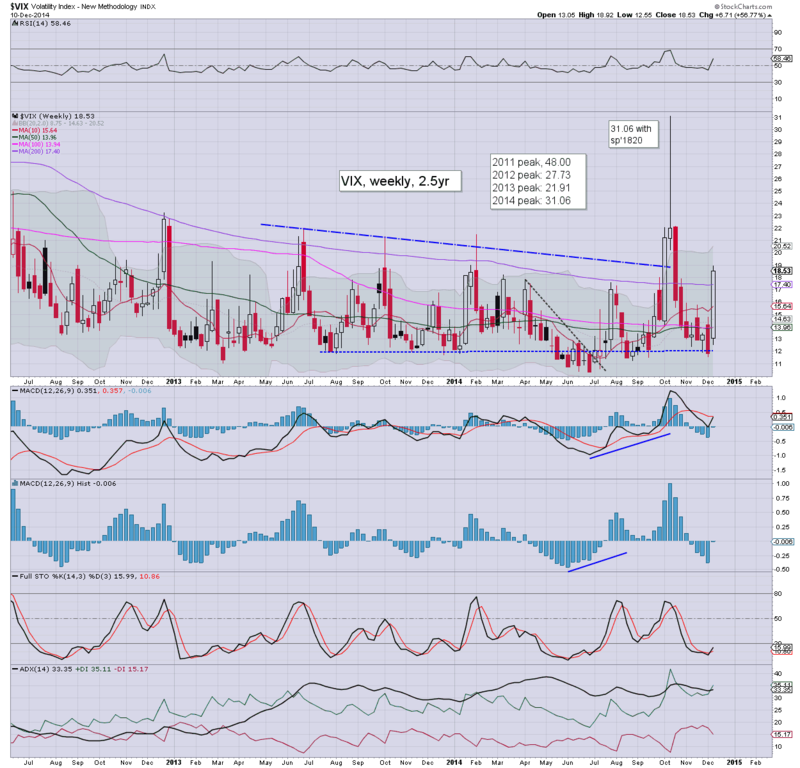 Near term outlook is for sp'2000/1980, along with VIX 20/22. Certainly, at least today did not see a repeat of the nonsense that was yesterday afternoon. A somewhat amusing day.. after yesterday's annoyance. To those bravely shorting.. congrats.. .. but the FOMC clock is ticking. Unlike yesterday, the bull maniacs are failing to show up. We're headed lower... eyes to the VIX.. a close in the 17s..or even 18s would certainly offer 20/22 within the next 2-4 trading days. The action in Oil remains particularly amusing, with lower energy prices bullish not just for the US of course.. but for the world. Look for strong efficiency gains/increased profit margins in most Q4 and Q1 earnings reports. The really exciting outlook is for Oil to remain lower for the entirety of 2015. The precious metals miners will be greatly helped by that...even if metal prices themselves also see another major wave lower. Equities are increasingly weak, as the energy sector is smashed... due to a renewed collapse wave in Oil prices. 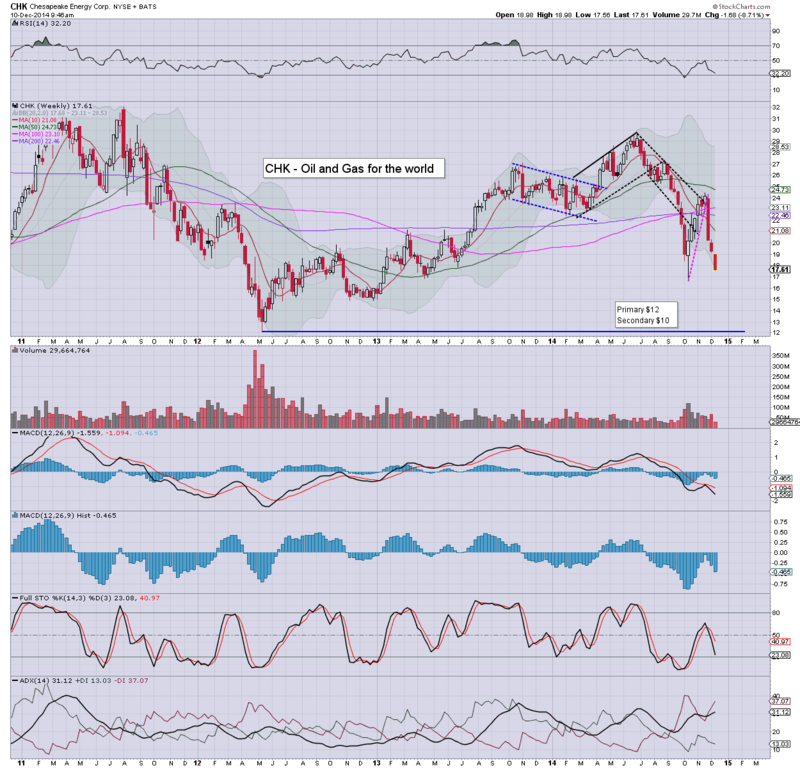 WTIC Oil is lower by around -4%.. set to lose the $60s today. 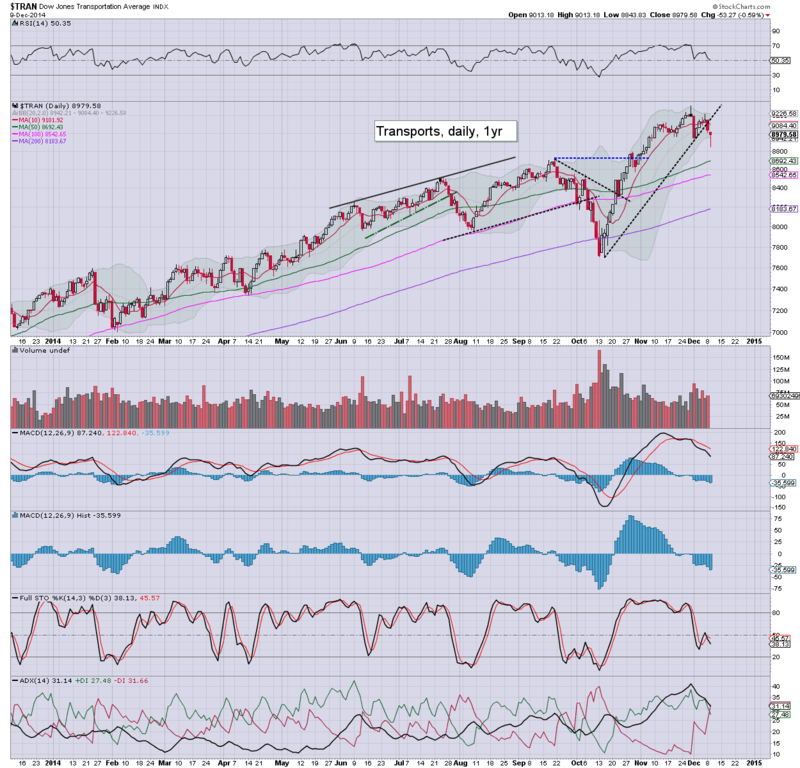 Next support is rising trend.. in the 57/55 zone. VIX is holding sig' gains of 10%... set for the 17/18s. 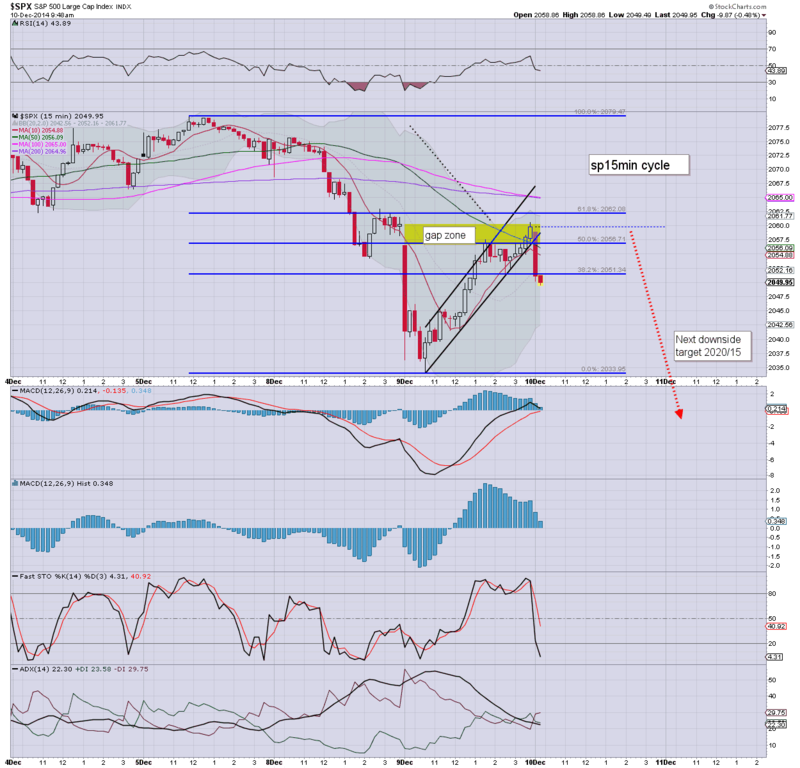 So.. yesterday's latter day bounce was indeed just a 'stupid bounce'... if a disturbingly powerful one (not least in R2K). 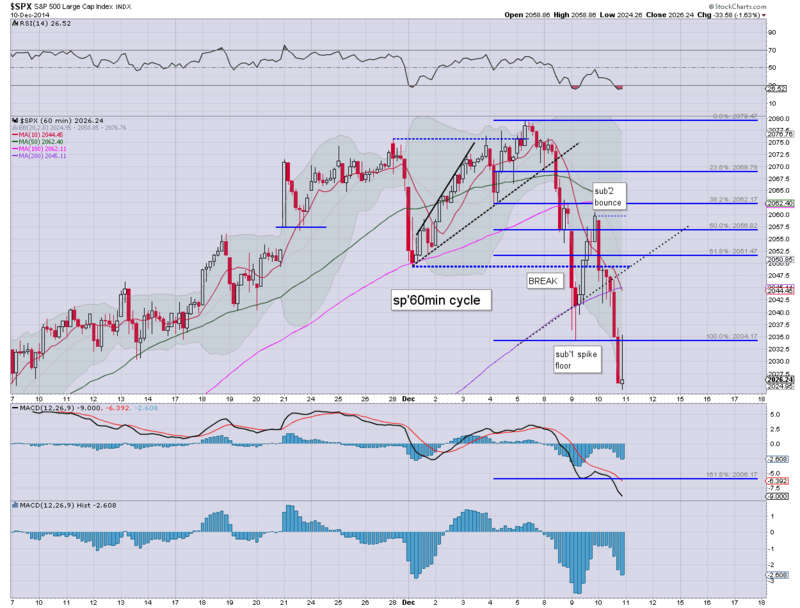 Equity bears should be seeking a break of the sp'2034 low... and that opens up 2020/15 by the Friday close. 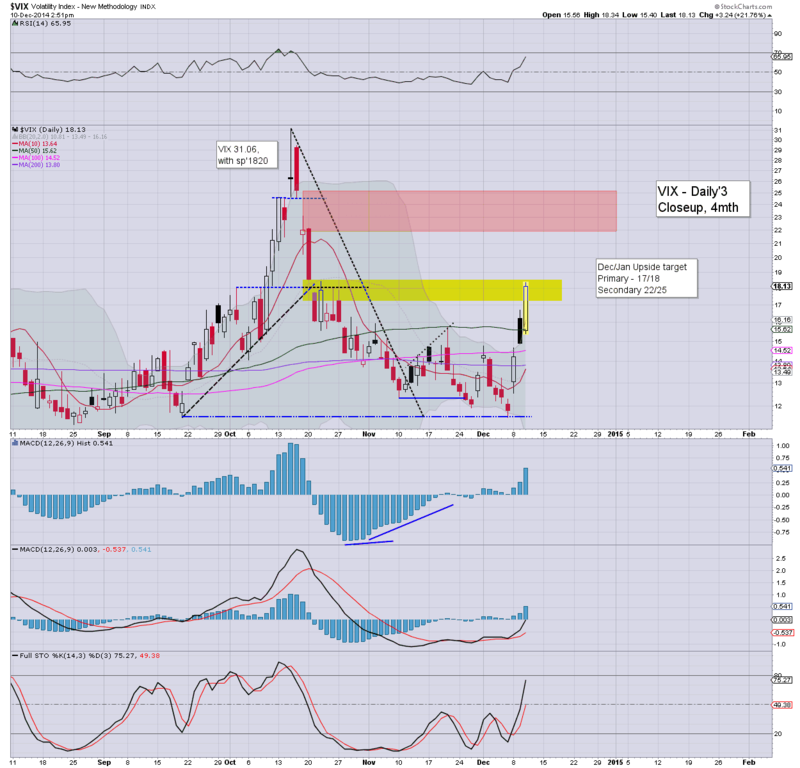 VIX is certainly confirming today's weakness, higher for the third consecutive day. 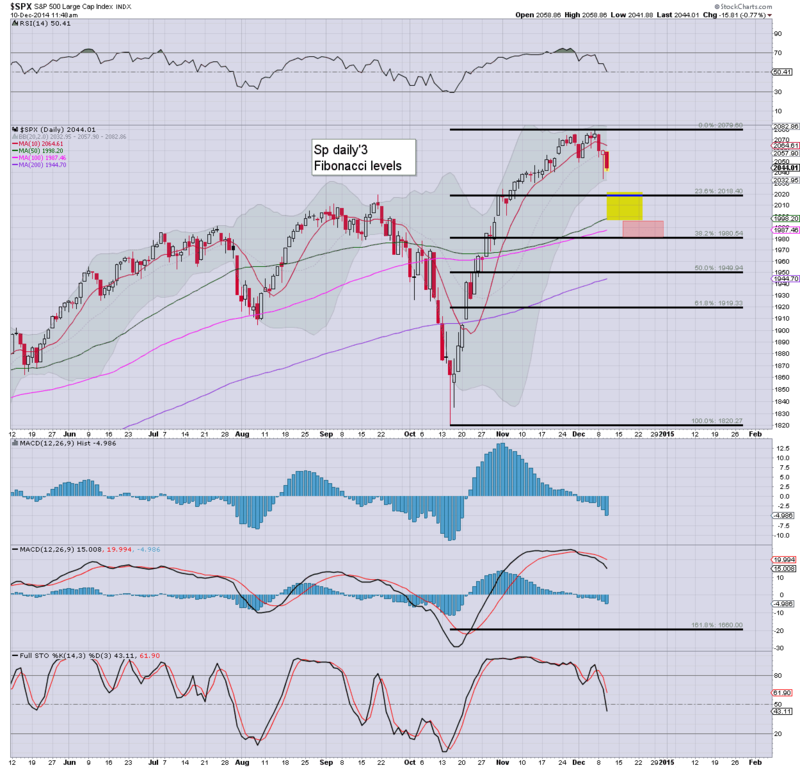 US equities open moderately lower, with the sp' already back in the 2040s. VIX is higher for the third day, the 17/18s look likely by end of the week. Oil breaks a new multi-year low, -2.5% in the $61s. Metals are cooling after the recent two days of strong gains. 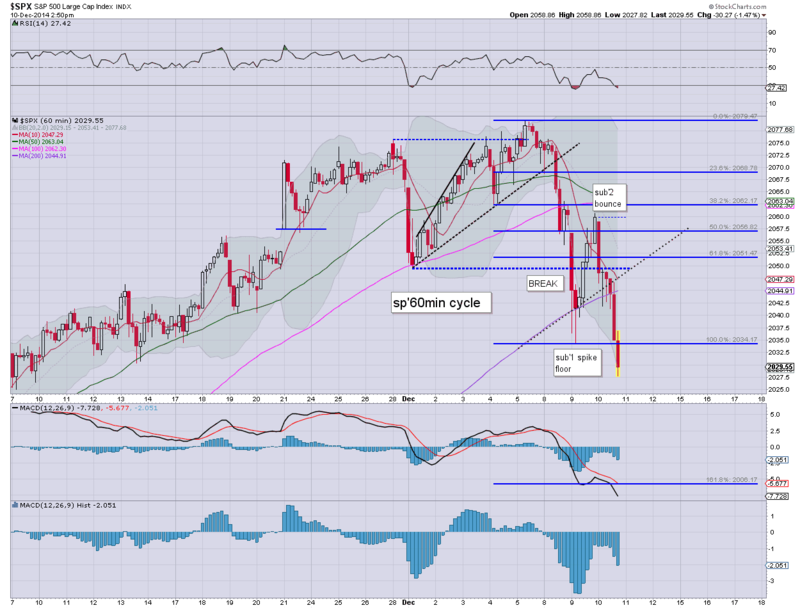 So... we're back on the slide... with the obvious first soft target being yesterday's low of 2034. VIX is certainly confirming the increasingly twitchy market... it looks set for the 17/18s... if not 'briefly' 20 threshold. Seen on the bigger weekly cycle.. the downside for Chesapeake is pretty clear.. its very likely headed for 12/10 zone.. before the first real attempt at a key floor. 10.33am.. Oil inventories out... net gains... oil prices collapsing -3.3%.... sub $60 possible.. at ANY point. Good morning. Futures are a little lower sp -6pts, we're set to open at 2053. Metals are a touch higher, Gold +$1. Energy is mixed, Nat' gas +1.0%, whilst Oil -1.8% in the $62s. 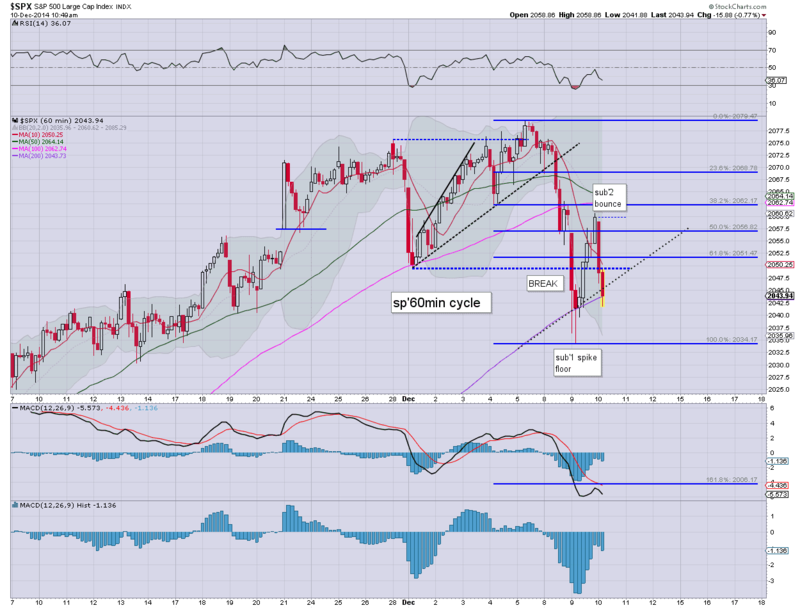 An equity retrace still seems very likely, but... the FOMC clock is ticking. So.... what about today? Clearly, yesterdays' latter day bounce will have calmed the concerns of those who are still seeking the sp'2100s before year end. As it is, I still think there is a very viable window of opportunity for the bears to knock the market lower by 2-3% by the FOMC of next Wednesday. What many do seem agreed on... the FOMC will make for another floor... and excuse for the market to launch higher into the new year. Video update from Mr C.
The end part on the USD is interesting, although I'm more interested in the implications for next year, not least in increase capital flows into the US from EU/Asia. No doubt bail-ins are coming at the next crisis, but will the US Govt. really let any of the major banks/institutions go under? Regardless... for anyone with cash in the banking system..when the next crisis hits... expect at least some of your funds to be forcibly taken away from you! On that note of state theft, have a good day. The last few days have seen some interesting drama in world equity markets. China has seen the giant ramp from the summer conclude, with a severe intraday reversal. The Greek market has imploded, falling -12% in a single day, whilst the Russian market continues to collapse. *first, a closer look at the Shanghai composite, which when seen on a daily chart.. really did go crazy bullish since July. An incredible ramp, roughly.. 2k to 3k.. a 50% ramp across just 8 months. 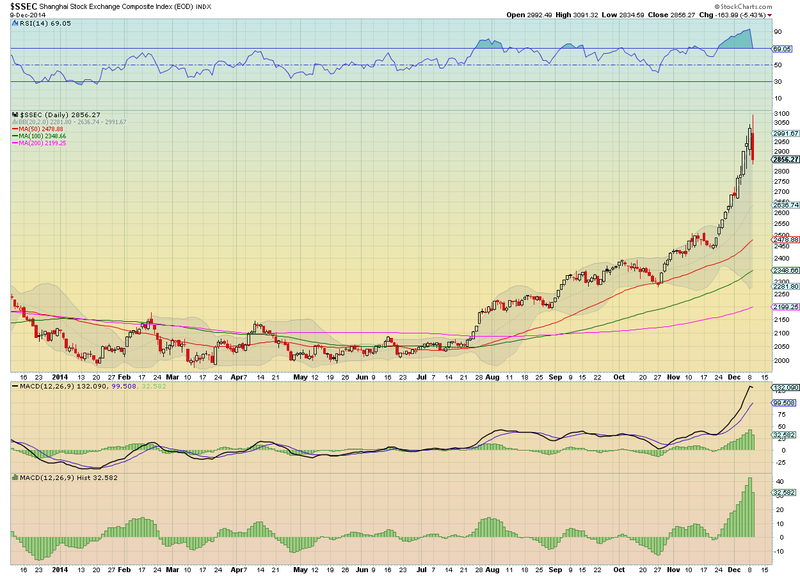 3500 will no doubt be hit after the current 'shaky retrace' is complete. The real issue is whether a sustained break >3500 next year... if yes, then 5/6k.. which would bode for broader Asia market strength... and that would surely feed across to the US and even weak EU. 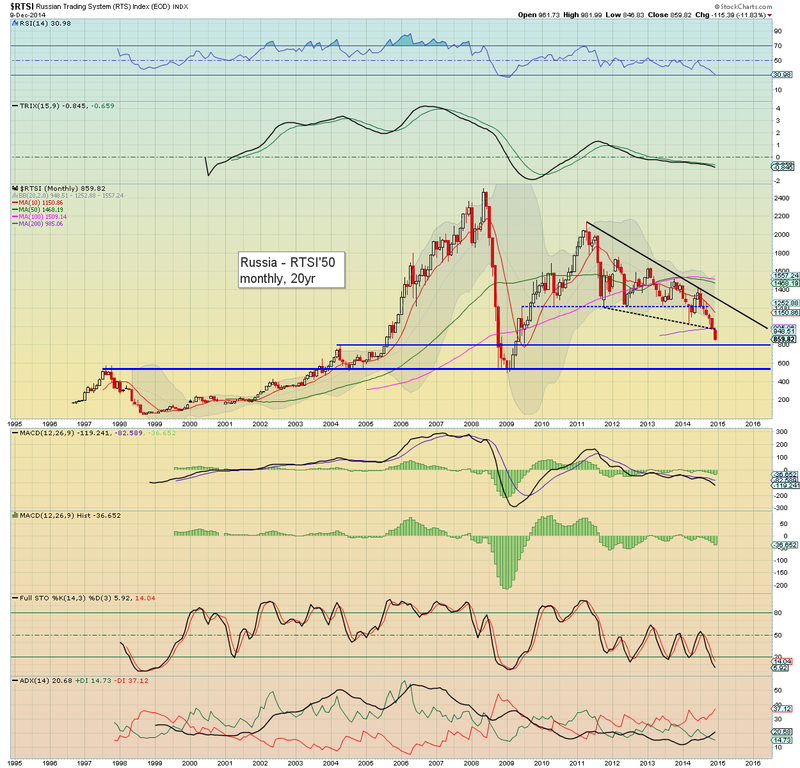 re: Russia... a new multi-year low of 846. 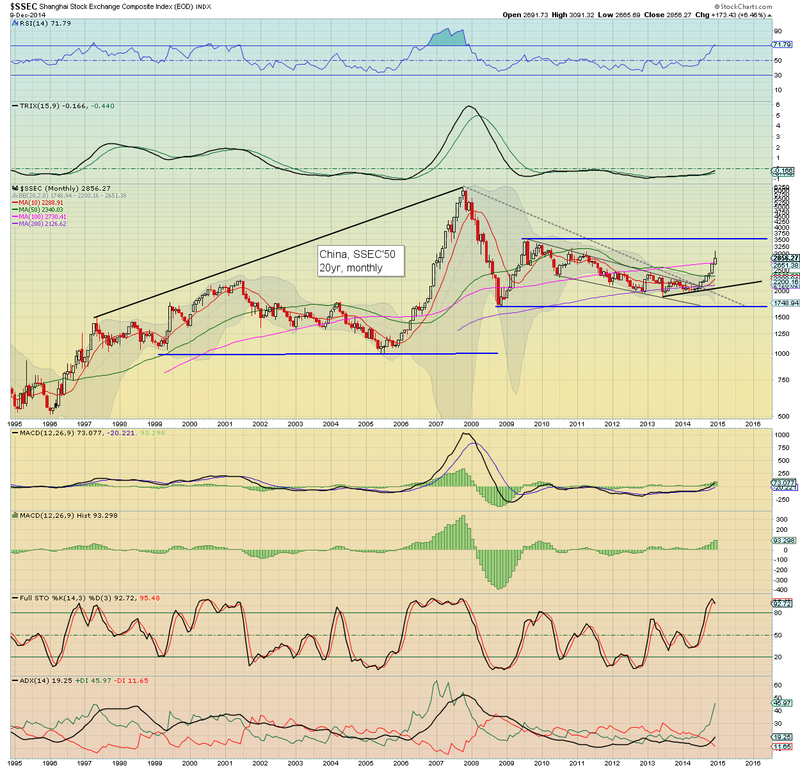 If the 800s fail.. .which now seems very viable - not least if Oil slips into the $50s, then the secondary target of mid 500s would be a valid target for first half of 2015. An extreme -12% daily decline for the Greek market.. especially weighed down by the announcement of an earlier than expected 're-authorisation of the presidents term'. So.. not long to wait.. and it'll certainly add some 'spice' just before Christmas! Price structure was a large bearish flag on the daily, today's break lower was not a surprise, but the scale certainly was, the biggest one day decline since 1987. 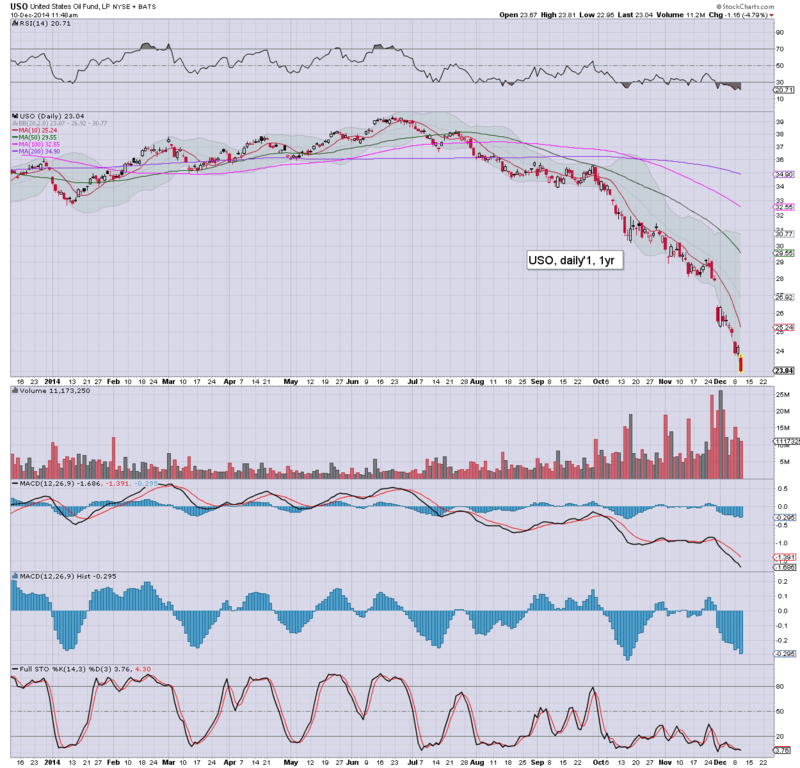 The Athex needs to hold the Oct' low of 852.. or the summer 2012 lows (471) are once again viable. That sort of renewed collapse would be a real problem for other EU markets, via a spillover/contamination effect. 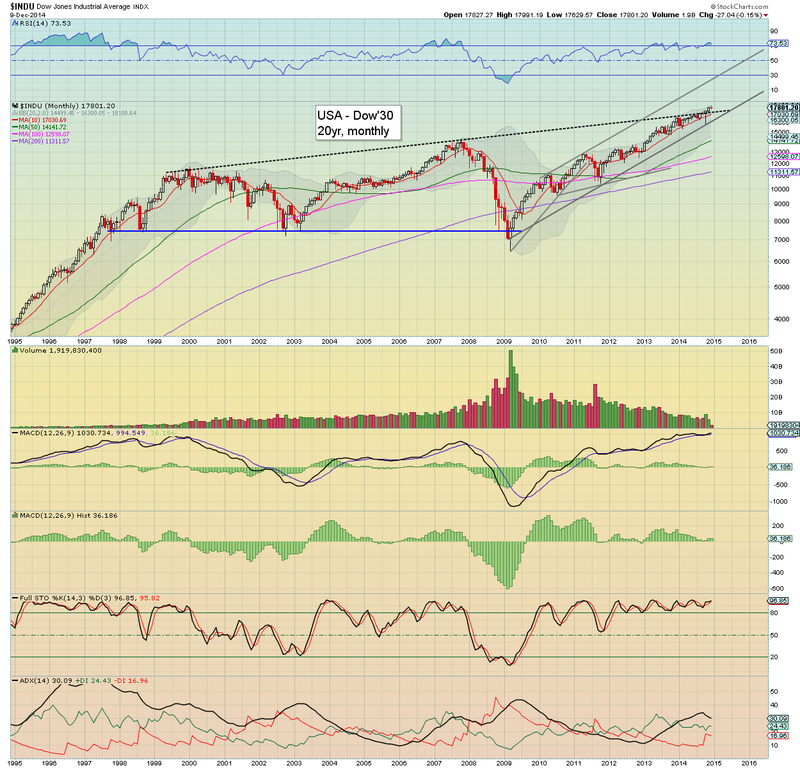 As for the US market... unless Dow 17k fails at some point... there is nothing for the equity bears to look forward to. Wednesday will see the US Treasury budget, although these days.. hardly anyone cares. After all, if the treasury lacks enough tax revenue to cover expenditure.. just issue more bonds.. and the Fed will indirectly buy the bonds (from select institutions) with new 'QE money'. Despite the latter day bounce, a retrace finally seems to be underway, with the sp'500 settling -0.5pts @ 2059 (intra low 2034). The two leaders - Trans/R2K, settled -0.6% and +1.8% respectively. 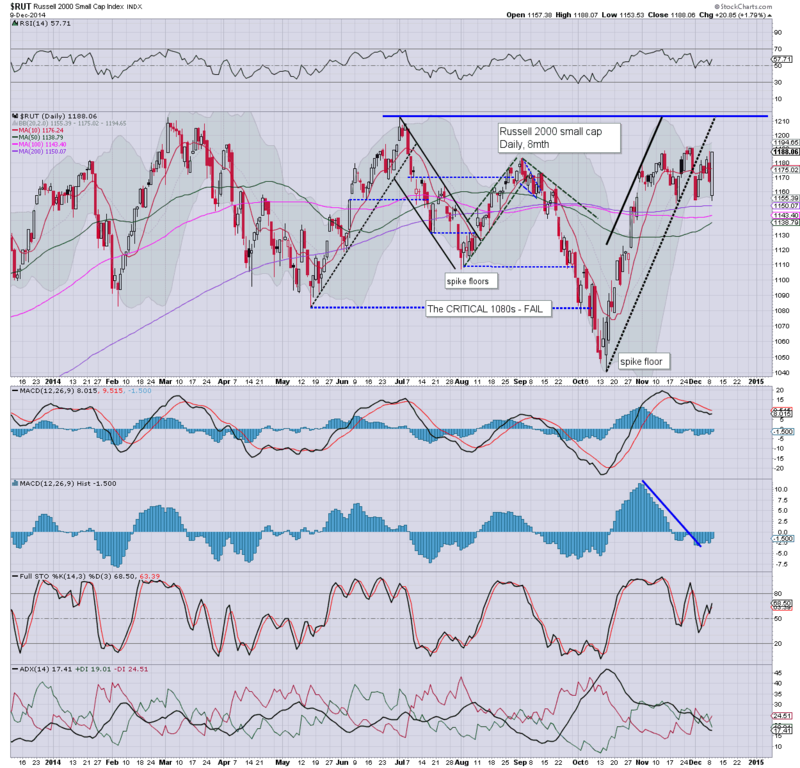 Near term outlook is for 2020/15.. if not 2000 before the next FOMC. Suffice to say... despite the strong intraday bounce (esp' in the R2K/Nasdaq), price action IS different from the past few weeks, and we're likely at day'2 of a moderate decline. 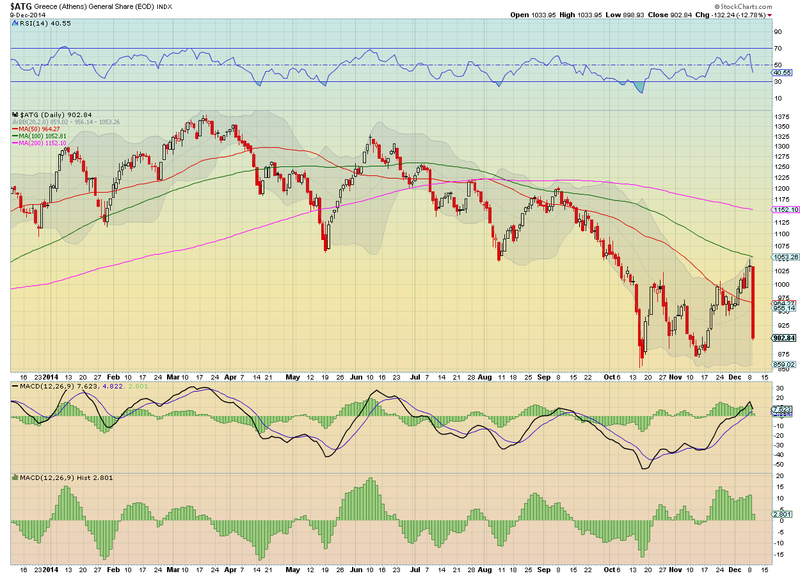 On no outlook do I see sustained trading below the giant sp'2000 threshold. 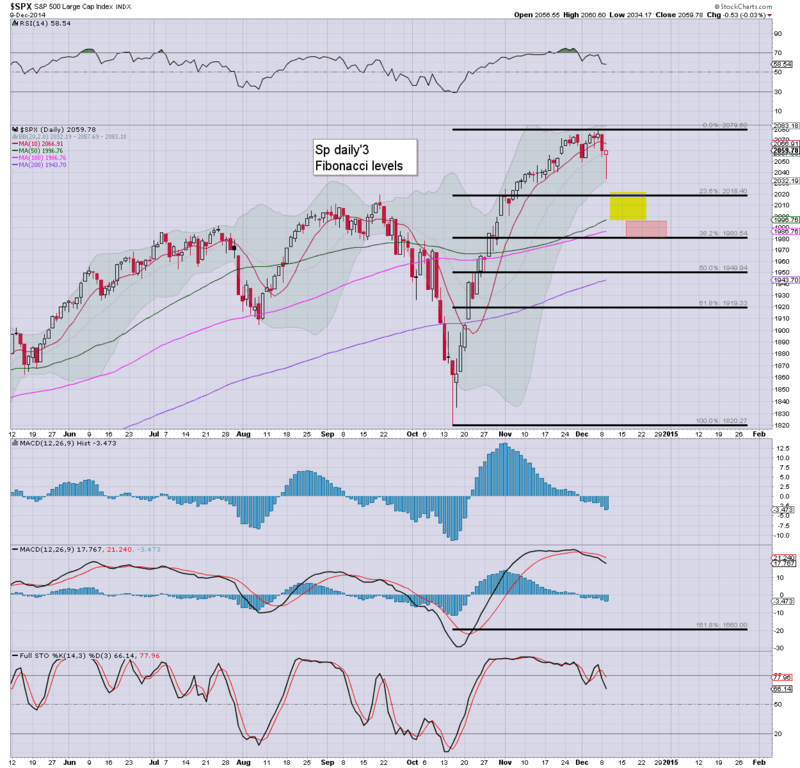 Perhaps 1980 - the 38% fib retrace... but it sure won't likely stay there for long.